When pairing a vertical bagger and combination scale, your top goals are speed, accuracy, and reliability. You anticipate a packaging line that embodies those three characteristics and runs perfectly, never breaking down and never needing maintenance. That would be amazing. However, much like my car never cleans itself or performs its own maintenance and repairs, neither does a combination scale and VFFS. They unfortunately need help from us humans. One common problem which peskily does not take care of itself involves the product charge and is often referred to as a string out. The transition of the product from the scale involves an ideal product charge. This charge delivered from a scale is ideally packed together as it transitions from the scale discharge funnel into the inlet of the forming set. String outs are an extended length of the product stream. Ones that spread out and do not retain that tight, ideal form. When the product leaves the scale bucket, it will slow down if it hits a rough spot and will consequently, string out. Think of the rough spot as a speed bump. The slower the product travels the more time it will take to reach the bag. This is why having the correct steel material is crucial. Free flowing products can slow if run on a scale with dimpled metal. Conversely, if the products are sticky, the dimpled steel can help reduce string out. Unfortunately, string out has negative drawbacks such as product in the seal, inaccurate weights, and reduced productivity of the scale and bagger stack-up. Steven White, with more than 30 years of experience in the packaging industry, informs us that troubleshooting product string out involves three major areas: The combination scale, the scale to vertical bagger transition and the bagger forming set. More stagger delay than needed in the scale setting will cause the product to string out. The more stagger, the less compact the product will be. To minimize string out, keep the stagger delay to a minimum or do not use any at all. A mechanical issue with weigh buckets doors not opening or closing properly can cause string out. In some cases, the product charge can be too large for the weigh bucket or scale. If a scale is designed to run a 1 oz. product, running a 5 lb. target weight could result in overfed buckets. This will lead to inaccurate weighments and large amounts of string out. Discharge chutes need to be aligned properly for smooth product transfers. New machines should be engineered correctly to have the angled chute match the angle of the forming set. This helps reduce product string out through the chute. The transition design needs to be large enough so the product can pass through without hour glassing or string out could occur. Transitions need to be aligned properly so there are no catch points along the travel. Funnel angles need to have the steepest angles possible (65 degrees or more). The angles of the chutes cause product to fall at a different speed. Shallow angles flow slower than steep angles, therefore, string out is higher on a shallow angle. Mating with the funnel discharge needs to be only slightly larger to fit around the upper funnel or scale discharge. If it's too large, this will cause the charge to restructure as it leaves the funnel and change the shape of the falling charge. When you change dimensions, it also alters the shape of the charge, which causes it to string out. You want everything to be uniform. The inlet funnel must fit the diameter of the inlet to the forming set. Funnels should be locked down and unable to move as product flows through the transition. Dump timing should be set to drop product onto the jaws as they close. Spreader bar design on the discharge of the forming set should not hinder product transitioning during bag formation or inhibit film from advancing. Scales are designed for piece length, target weight, product characteristics and speed. Products that are light, however, have a chance to string out more than a dense product. This is because, when they are dropped from the weigh buckets into the scale chute, the product tends to catch more air. Sticky products are also more prone to string out. Anything that runs on a scale, however, has the possibility of having a string charge. 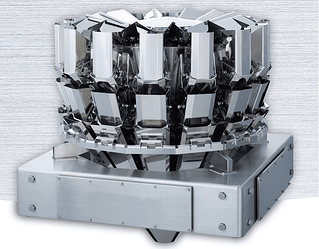 Radial combination weighers have transition capabilities to reduce string out at the bottom of the scale. As seen with the troubleshooting areas mentioned above, string out is often a result of a scale designed or built incorrectly or when someone performs sanitation. If you are planning on changing the product size a year later, this needs to be imparted because the scale may not be designed for a larger or different product. Or if you buy a used scale, it may not work with your product. This is why communication is key in getting the exact Multihead Weigher/ Vertical, Form, Fill Seal combination you want for your product. Let us know your thoughts! Note: Special Thanks to Steven White and Dustin Literski for contributing their knowledge and experience to this post.